We are located on the Tramore road in Waterford and offer a collection and delivery service locally and nationally. 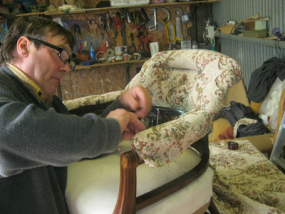 We also offer a complete restoration service which includes traditional upholstery, furniture repair and french polishing. We can carry out on-site bar and hotel repair work as well as insurance assessments and reports. An extensive range of upholstery fabrics and upholstery supply for DIY enthusiasts is also a service we provide. Finally we partner with well known interior designers in the South East of Ireland to provide a comprehensive interior service.